Officials said a woman was attacked and killed by a neighbor's dogs on Thursday night. Carter County Sheriff Chris Bryant said the victim -- whose name has not yet been released -- was attacked by SEVEN DOGS and later died from her injuries. Bryant said the incident happened before 10 p.m. at a residence just east of Ardmore on Banyon Road. He said one of the dogs was a PIT BULL, the others were medium-sized dogs of other breeds, all with the same owner. 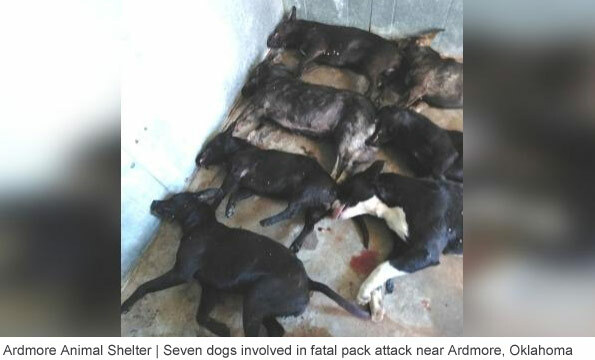 "Once we were notified that this female had succumbed to her injuries, the owner of the dogs decided to put the dogs down," Sheriff Bryant said. There have been no arrests. Bryant said he believes the victim lived in the area of the attack. "It's really scary because my kids play out here all the time," one neighbor told KTEN. "Even if I'm out here with them, it's just scary having dogs roaming around attacking people." There is no "leash law" in unincorporated areas of Carter County. "Most municipalities do, but the county does not," Sheriff Bryant said. "Just be aware your your surroundings and if you have any issues with livestock or animals or anything like that, please give us a call." The sheriff said the autopsy results will be forwarded to the district attorney's office to determine if the owner of the dogs will face charges. Hard to tell, but looks like a pit bull and a bunch of mongrel relatives. Good to see them all napping like that, though. Oh yeah, not a collar or license on a one of them. Responsible owner, much? Someone please charge them with something!